Peering into my computer screen, it was great to start my morning here in China with 15 inspired ladders (complete with festive Halloween attire!) for a rich Week 5 Laddership Circle! As we now move into the 6th and final(!) 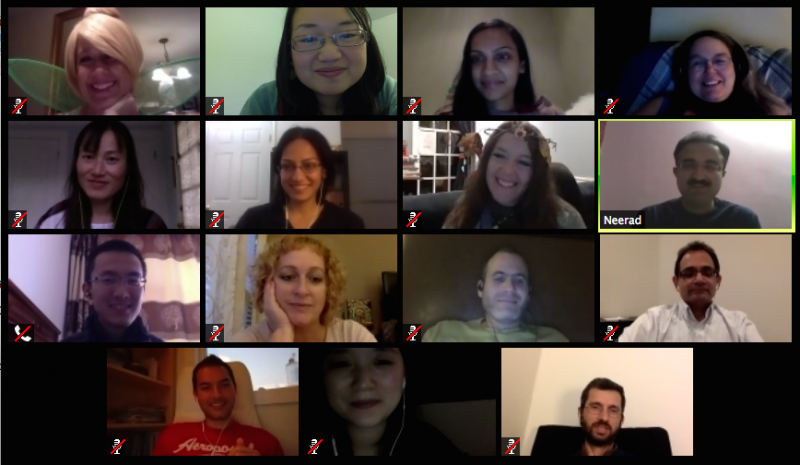 week of our October circle, it's been humbling to witness all the experiments and insights that have been surfacing-- online, offline, and everywhere in-between. "I was just a witness to the power of ripple effects from invisible acts of kindness—things that you just do with your words, or with who you are as a person. I was speaking at a retail forum this week. I was invited to speak on a ‘marketing’ topic. My topic was: "How do we design so deeply for love that we can remove the price tags off of our business?" :) It was really great, because after speaking, the largest grocery chain here, their head of marketing came up to me and said that he had texted his team—and the next day, in five of their stores, they were having no price tags on their bakery division! It was just really fun to see this week how deep we can go with just showing up. And how invisible the ripple effects are." "I take the train to the downtown area quite often. There are generally many homeless people at the train station where I get off. Like everyone else, I have someone learned to limit making eye contact with homeless people knowing that it will encourage them to beg for money (which I have been told is not good to give, as they end up using it for cigarettes or alcohol). I saw this old lady and couldn’t help seeing her in the eye. Her eyes radiated some deep pain that stuck my heart. Just as I passed her, her cart (with her belongings) fell and all her things dropped on the pavement. As I saw her struggling to pick it up, I turned back and asked her if she needed help. Suddenly, she yelled out to me, “I hate you!” I saw couple of people grinning at my stupidity to help someone who was obviously unbalanced, emotionally and perhaps psychologically. But what surprised me was that the next moment, I completely ignored her and began picking up all her stuff and put it all back on the cart. She stood back and said nothing, obviously surprised that I had not walked away. It took me a few minutes to stack up her stuff as they were all disorganized and sprawling out of all the many plastic and paper bags she had gathered. When they were all done, I just turned and began walking as I didn’t want her to feel that I expected her to thank me or even feel remorse of any kind for yelling at me. What was really surprising was that I really don’t know how or what made me do that. I generally don't like to think or talk much about any act of kindness I do, but this seemed to be coming from a space that I had not touched before. It is rare that I impose myself like that to help someone. It basically felt that I was just a mere instrument to show unconditional love to someone who was in deep pain. But there were ripples of joy in my heart all day long for this wonderful opportunity and gift I had received." "On Thursday, when I helped put away the chairs after a weekly event, my heart was filled with a bit more genuine gratitude than usual. I felt grateful that every week some people come early and place all the chairs in rows before I arrive. Many weeks after the event, when I was caught up in talking to someone, others helped put away my chair. Now I had this precious opportunity to do something for others. How wonderful! Such a tiny shift on my inner landscape made a huge difference. Carrying the heavy chairs was no longer something I do to try to be kind, try to be a ladder, or try to impress or please someone. No more trying. Only pure joy. And the chairs suddenly became lighter. I need to refer back to Mother Teresa's words again! "It's not how much we give but how much love we put into giving."" I think you neglected this story! How negligent! I found a "Karma Kitchen" chain in China :) There's a network of gift-economy restaurants called Yu Hua Zhai (Rain Flower Hut). The first one was founded in 2011 by an old monk who have since passed away. It's essentially Karma-Kitchen-style: everything run by volunteers, they gift vegan lunch to anyone who comes in, infused with love, care, and respect for the elderly. Volunteers bow 90-degree to all guests at the door. The values of generosity, environmental awareness, compassion for all life, and traditional teachings are shared before the meal as context. Everyone share gratitude before lining up for food. The meal is served and enjoyed in silence. Everyone is invited to have as much as they'd like, and not leave anything behind. If a [...] See full comment. I think you neglected this story! How negligent! I found a "Karma Kitchen" chain in China :) There's a network of gift-economy restaurants called Yu Hua Zhai (Rain Flower Hut). The first one was founded in 2011 by an old monk who have since passed away. It's essentially Karma-Kitchen-style: everything run by volunteers, they gift vegan lunch to anyone who comes in, infused with love, care, and respect for the elderly. Volunteers bow 90-degree to all guests at the door. The values of generosity, environmental awareness, compassion for all life, and traditional teachings are shared before the meal as context. Everyone share gratitude before lining up for food. The meal is served and enjoyed in silence. Everyone is invited to have as much as they'd like, and not leave anything behind. If anyone leave food in the bowl, the volunteers will eat it. No monetary transaction is involved. The effort is supported by donations and volunteers -- any surplus goes toward opening new restaurants. By now (within 4 years), there are over 300 "chain stores" in the network. These restaurants are especially created to serve the elderly, who often live alone. The volunteer who kept books for donations was also very moved to learn about the kindred spirits on the other side of the Pacific, carrying on the same work and values. Hide full comment. So glad Xiao included your story Zilong of Rain Flower Hut. It lit my heart up. Thank you for writing this. ♥. Zilong! I need to ask you if you know any middle school age kids there who are doing service of kindness. Or anyone! I want my students next year who will be in the class that I AM doing to skype or Zoom with kids around the world and connect like we do!! I need to ask Natasha and Neerad too! Wouldn't that be amazing?! There's never too many reminders that change is taking place, we all can be moved by caring for others. Thank you Zilong and Xiao for sharing.